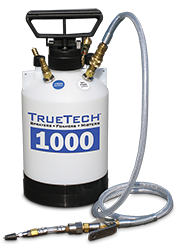 The TrueTech 1000 compressed air sprayer is a portable professional grade liquid sprayer that can be used to apply any flood remediation chemicals. It is small enough to carry into tight situations, yet has features making application easy, reliable and flexible. TrueTech sprayers are the most flexible and highest quality equipment available on the market today.